Every year I spend hours and hours online, searching high and low for just the right calendar. I’m lost without one, but I’m very very fussy about them, I mean you’re going to be looking at it for a whole year! For me it’s not just about the pictures, though that does play a big part, the layout, the size of the squares, the size of it overall… I won’t bore you with the rest of my scrupulous list, as it goes on and on. The secret is out. 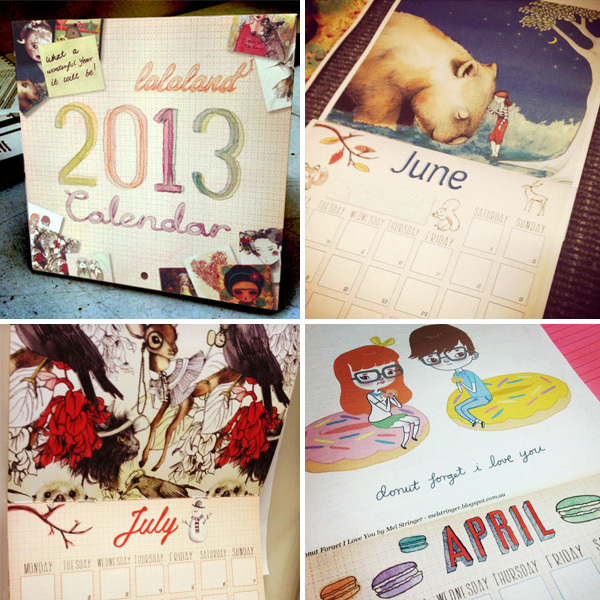 Anyway, Lalaland have put together a 2013 calendar featuring lots of great illustrations. And upon first look it seems to tick all of my boxes. Good job Lalaland! I’m proud to be included. You can buy it online for just shy of $20 right here!